Real Madrid are reportedly targeting the transfer of Borussia Dortmund attacking midfielder Christian Pulisic as a replacement for Gareth Bale. According to Don Balon, Real Madrid president Florentino Perez expects to raise around €100million from Bale’s sale and beat the likes of Chelsea and Liverpool to Pulisic for around €80m. The USA international is one of the most exciting young talents in the world at the moment and one imagines a big move is just around the corner for him. According to the Evening Standard, Chelsea have made an official approach for Pulisic, though it’s suggested he may prefer a move to Liverpool. It remains to be seen if Los Blancos can put themselves in pole position in this transfer saga, but they could certainly do with a shake-up in attack at the moment. Madrid sold Cristiano Ronaldo to Juventus in the summer and players like Bale have not managed to step up in his absence. 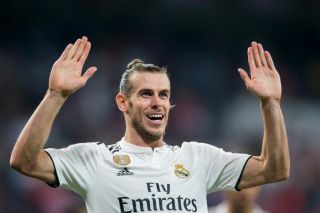 It is unsurprising to see Don Balon claiming Real want to offload Bale, though Perez might be a bit ambitious expecting €100m for the Wales international at this moment in time.